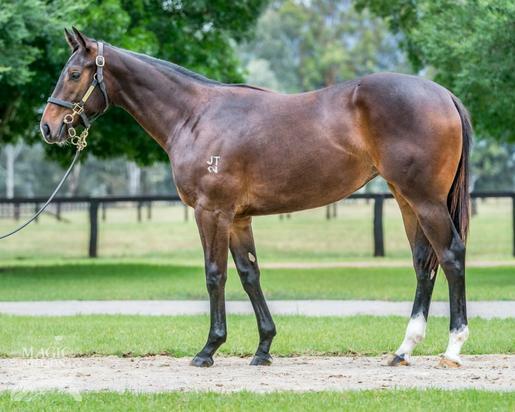 Lovely filly purchased at 2019 Magic Millions Yearling Sale for $150,000. She is a full sister to Stellar Collision, 9 time winner & Stakes winner. This is a Christine Cook ladies only lease. STELLAR COLLISION (g. by Star Witness). 9 wins-1 at 2-to 1200m, A$561,600, to 2017-18, MRC Christmas S., L, MRC (Mornington) Hareeba S., L, SAJC Adelaide Cup Raceday H., MVRC Ascend Trophies Premium P., Opus Group Tour of Victoria Sprint Final H., Melbourne Signage Concepts H., MRC Willhillwolfpack P., Cranbourne TC Apache Cat H., 2d SAJC Matrice S., L, Warrnambool RC Wangoom H., L-twice, Sale TC Viatek H., 3d MVRC Australia S., Gr.2, VRC Goodwood Racecourse Trophy H., L.
What a Legend (g. by Duporth). Placed in 2018-19, 2d HKJC Chevalier Aluminium Engineering H.
Harbour Trick. 3 wins to 1100m in 2017-18 in Aust. Fast Trick. Winner at 1200m in Aust. What an Impact. Winner. See above. Al Muhanad. Winner at 1600m in Aust. Namib. 2 wins at 1400m, 1850m to 2017-18, 2d Ipswich TC Channel 7 H., Labour Day Races H.
STAR FASHION (Street Cry). 3 wins from 1400m to 1600m, A$346,525, MRC Ladies Day Vase, Gr.3, Dalziel Racing Tile Importer H., 2d SAJC Schweppes Oaks, Gr.1, VRC Edward Manifold S., Gr.2, SAJC Centaurea S., L, Morphettville Guineas, L, 4th SAJC Centaurea S., L, Port Adelaide Guineas, L.
The Chairman (High Chaparral). 4 wins at 1600m, 1800m, A$251,415, VRC Twitter Trophy H., 2d BRC Chairman's H., Gr.3, 3d BRC Premier's Cup, Gr.3, Kilmore Cup, L.